LOCATION: The race will be held on the D&L Trail starting at the Lehighton Outdoor Center, 123 Lehigh Drive, Lehighton, PA. COURSE: FLAT, FAST wheel measured course on mostly shaded combination of blacktop street and rail trail. Clock at finish, refreshments, mile splits, instant results. Rain or shine. No refunds or mailed awards. BIKE COURSE: Flat combination of blacktop street and rail trail. Bikes will be available for rental at Lehighton Outdoor Center for participants. 5k RUN/WALK AWARDS: Medals for overall male and female winners for 5k runners and walkers Medals for 1st 2nd and 3rd in the following age groups: 14 & under, 15-19, 20-29, 30-39, 40-49, 50-59, 60-69 and 70 Plus Medals are not mailed or given for the Bike Ride. Prizes for best dressed Hippies! ENTRY FEE: 5K Run, Walk or Bike Rides: $25.00 with shirt guaranteed if registered by 04/05/19. After that date and including race day entry fee is $30.00. Shirts available while supplies last. There is no fee for scholarship candidates to participate!!! To be a scholarship candidate you must currently be a graduating senior from a Carbon County High School or CCTI and a member of FBLA, DEKKA or in a business curriculum and continuing your education in a business field after graduation. 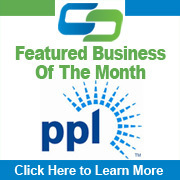 RACE DIRECTOR: Kathy Henderson, 570-778-8147 or email me at khenderson@carboncountychamber.org Checks payable to CCEDC. Lehigh Fire Co 1, Inc. 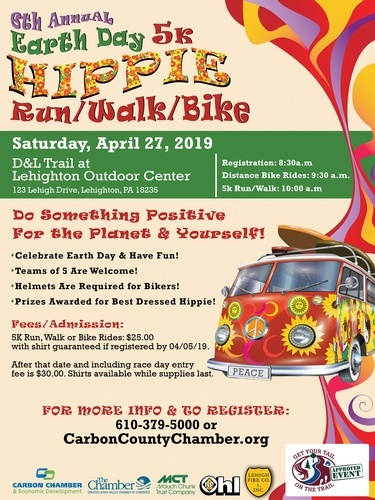 The race will be held on the D&L Trail starting at the Lehighton Outdoor Center, 123 Lehigh Drive, Lehighton, PA.
5K Run, Walk or Bike Rides: $25.00 with shirt guaranteed if registered by 04/05/19. After that date and including race day entry fee is $30.00. Shirts available while supplies last.